At Budget Blinds of Rockwall and Terrell, we're your local neighborhood experts that truly understand your needs. We're in your neighborhood, we know the local Rockwall and Terrell weather and community, and we’re backed by the #1 provider of blinds, shades, and drapes in North America. Over 25 years of customer satisfaction gives you peace of mind that only comes with choosing the proven leader. We bring the showroom to you in Rockwall and Terrell. We expertly measure your space, install beautiful window treatments, and back it up with the best warranty in the business so you can sit back and relax in the beautiful, Rockwall and Terrell weather and sunshine. We serve to give you the best in window treatments, so you can rest easy knowing your space will be beautified and optimized with window treatments that fit your individual needs. Thank you for allowing us to help you with your window treatments. During the last 8 years we've had the pleasure to do window coverings for hundreds of home owners and businesses. If you’ve been thinking about transforming your home’s interior into something truly special, Budget Blinds of Rockwall and Terrell is here to help. Our expert design team, paired with an array of stunning blinds, shades, shutters, drapery, and more creates the ideal home interior that complements any room, or an entire home. From the latest styles and innovative fabrics, to a host of on-trend colors, we’ll show you how fun and affordable it can be to upgrade your décor with the power of the #1 provider of custom window coverings in North America. Our consultative process is designed around caring about you and your home. We make the entire experience easy and convenient as we bring the showroom to you with our FREE in-home design consultation. From those unique shaped windows to energy efficient treatments, and more, Budget Blinds does it all for you, with style and service for any budget! We're local and here to stay to ensure you have peace of mind. Budget Blinds did a fantastic job from beginning to end! Sunni is as pleasant as her name! She was friendly and patient as she explained all the choice selections to us. The installation went smoothly and the plantation shutters look beautiful! I can’t wait to install more. – Mike & Sheila S.
We had a wonderful experience with Budget Blinds. Sunni was very knowledgeable and made the process easy. Brian and his team did a fantastic job with with installation of our plantation shutters and blinds. 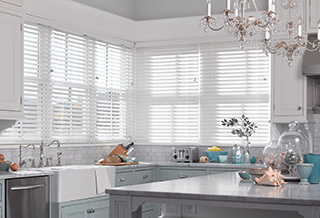 We were looking to install shutters and faux wood blinds in our new home in 2015. I found Budget Blinds through an internet search and after contacting them, Sunni came to our home to provide options and give us an estimate. We were immediately impressed with her knowledge of products and her warm and personal style. The standard window blinds and arch-window shutters we ordered are high quality and really look nice, and their installer did a great job. We have since had Budget Blinds install more shutters for us. We like their products and service so much, that we referred our daughter to Budget Blinds and now she has their shutters throughout her home. They are our go-to window treatment provider! – Tom & Nita H.